And so there were Sweetpeas, and God saw that they were Good. And He said, Be fruitful and multiply, and they didn’t need asking twice. And God tried to Divide the Sweetpeas from the Other Plants, and gave up, and the Sweetpeas creepeth along the earth and in the air and in the Firmament. And God ran out of Vases. 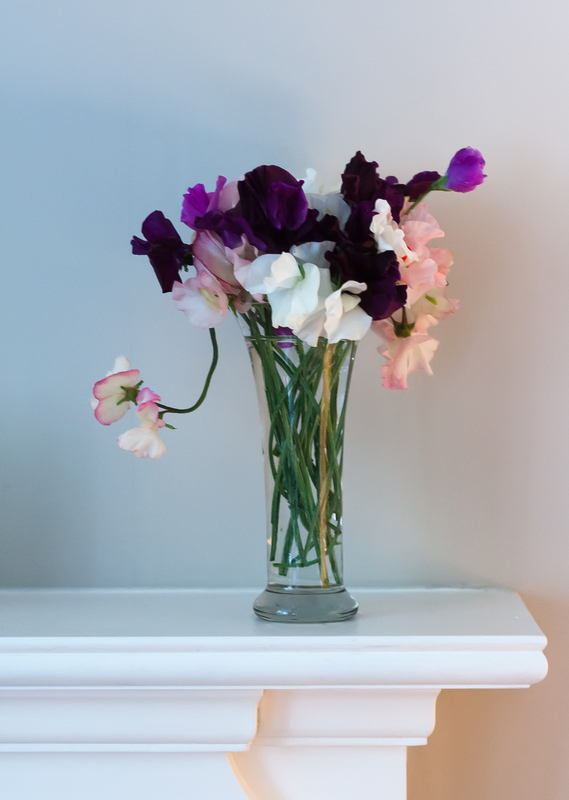 I had at least two large vases a week from these sweetpeas, plus the huge bunches I ended up giving away to neighbours, friends and my sister. I have Julie at Peonies & Posies to thank for this crazy abundance after I closely followed her instructions in this post about sweetpeas. I am so happy your sweet peas have been such a success and thank you for the link to my blog. My seeds for next year have just arrived so I will be sowing seeds for my greenhouse crop any day now! I am looking forward to seeing photos of those foxgloves!! Beautiful! That dark purple variety is absolutely stunning. Stunning…and I will be sure to focus on Julie’s instructions for growing my sweet peas next year…. Thanks – she had some excellent tips. The dark purples are fantastic, and look so good with the other colors. I haven’t grown sweet peas for a few years, your flowers make me want to have some again. It was fabulously easy – go for it! I couldn’t believe how many I got, even though that garden gets about two hours of sunlight a day. Enjoyed your humour as always and I also followed the link for more tips. My sweet peas have only been flowering for a few weeks as I was very late getting them planted, but they are doing quite well. Let’s hope the frosts stay away for a bit. Oh how I giggled at your introduction – thanks for sharing that as well as your lovely sweet peas. I like the white ones with pink edges the best out of your vase. Thank you! Those and the dark purple were the healthiest and most vigorous of all of the plants, and by happy coincidence my favourites too.